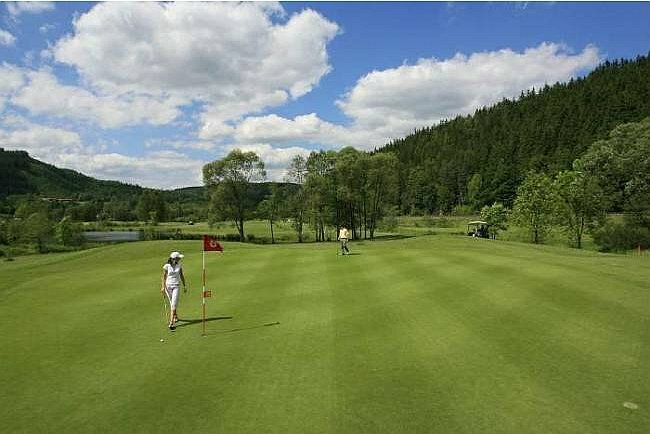 Astoria Golf Resort Cihelny - TBS - travel agency for all your travel needs in the Czech Republic! Services: complete training facility with 18-holes Honey course (pitch and putt) par 44, indoor driving range with social equipment and cosy cafeteria. Magnificent golf course developed by the Gary Player Design Company in 2001. The course is a very technical par 70, with a lot of water hazards and strategically placed bunkers. The club also includes an 18 hole Honey course (pitch&putt) with a par 44, a Putting Green and a covered Driving range, which, along with training bunkers make up one of the largest training grounds in Europe.) The resort has hosted The European Junior Championship in 2003. A very nice clubhouse offers full range of services.